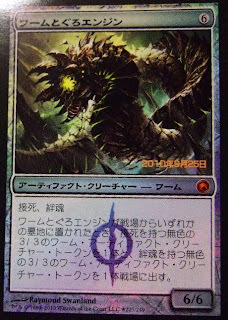 Yet another Scars of Mirrodin spoiler today from Japan . . . 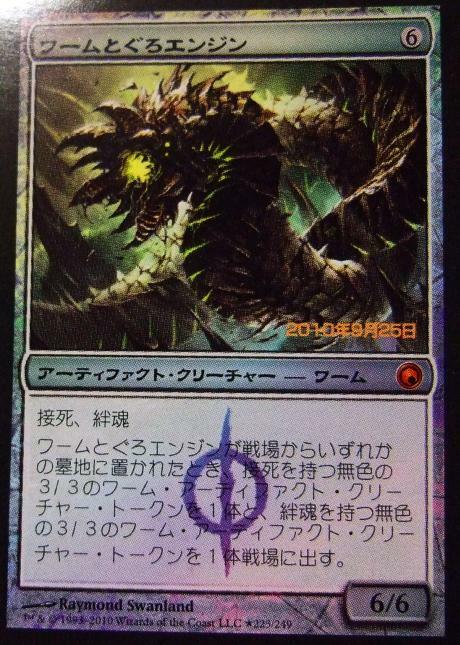 This time it is reported to be the Scars of Mirrodin PreRelease promo card - Wurmcoil Engine. 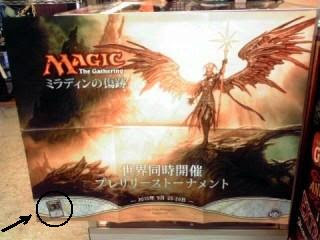 Original source is here which was apparently taken from the Scars of Mirrodin Launch Party poster directed to Saitama, Koshigaya City, just a bit north of Tokyo, Japan. Again, this is not official - the language translation may be a bit off or it may be a complete fake but let's have a look . . .
here is what the translation is thought to be . . .
when Wurmcoil Engine is put into the graveyard from play, put a 3/3 artifact wurm token with deathtouch, and a 3/3 artifact wurm token with lifelink into play. Six colourless mana delivers a truck-load of card awesomeness here and will likely give the M11 Titans a whole lot of trouble when this gets dropped on the game table. There is some confusion just at the moment whether it is a "and" or an "or". This could mean that you could get two 3/3 tokens (a life-linker and one with deathtouch) or just one of your choosing - however it plays it, this will be something rather powerful. Paying six mana for 9 or 12 power on the battlefield certainly will get attention. Looks like artifacts are gonna rock in Scars of Mirrodin - start planning now. 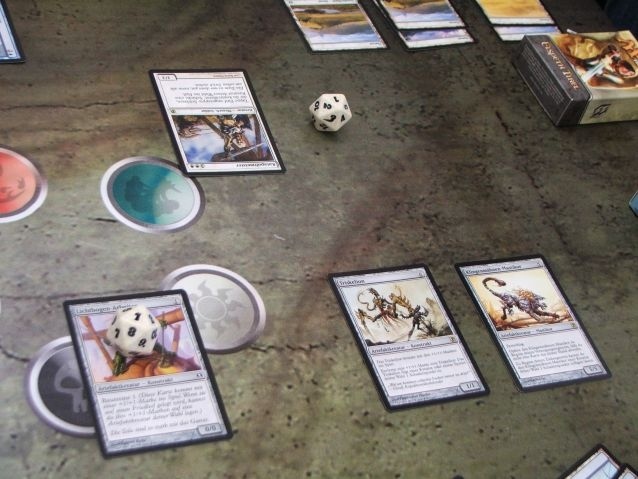 We have some incredible Scars of Mirrodin spoilers for you right now. 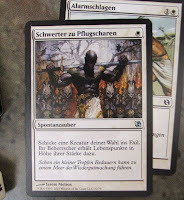 These are from a source who had the pleasure of translating the Scars of Mirrodin Frequently Asked Questions document. Unfortunately, the translations are not all that clear (original Japanese post is below) so please do not take everything quite literally. Also - these are unconfirmed spoilers and we strongly caution you to rely only on the official previews from Wizards of the Coast. The original post did have an April 1st date (April's Fool's) in there but wow, quite elaborate not to be passed over without an evaluation. Original source found here. 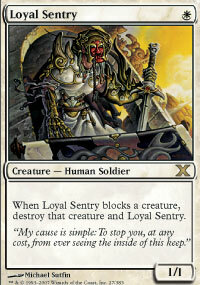 Affinity is the ability first appeared in Mirrodin block. It is the ability to reduce the cost of spells, can have any type of card that can cast a spell. Each time you cast a colorless spell , enchanted creature +3 / +3 until end of turn. Entwine is the ability first appeared in Mirrodin block. It is written in the form of extra cost, can have any spell with the mode. Return target permanent card in a graveyard to its owner's hand. Find a basic land card in your library and put that card into play tapped. shuffle your library. Target creature gets +4 / +4 until end of turn. Fortify first appeared on one "Future Sight" card - "Darksteel Garrison". Tap target creature whenever you fortfy a land. Fortified (4) : (4: Attach to target land you control. Fortify only as a sorcery. (T): add one mana of any one color to your mana pool. (2): until end of turn, Motorized Soldier become a 3/4 Artifact Golem Creature. Eclipse is applied when the spell is the permanent solution is the ability counterpart. Equipped creature gets +2 / +2 for. Equipment (X) X Clearsteel Flail is being placed on the number of counters equal to consumption. 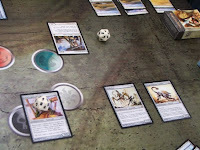 "Scars of Mirrodin" contains a "Artifact Planeswalker" card with the artifact in its type line. 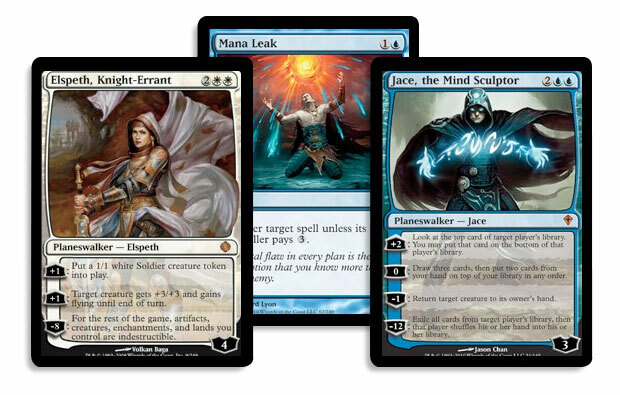 These are permanent, and artifacts as well as a planeswalker. They are an appropriate target for the effects of artifact affinity (artifacts), ability to count them as artifacts. "Artifact Planeswalker" loyalty ability, the ability to be run according to the same rules as non-artifact planeswalker loyalty. [-1]: Put a 0/4 creature token into play battlefield that had defender and is indestructible. [-5]: You may return any number of artifact cards from your graveyard to the battlefield under your control. That's it for now - check back latter - below is the original post in Japanese. We wanted to yatter about the local meta game today which kind of went head over heels for that white weenie life-gain archetype using the M11 Ajani's Pridemate and Soul Warden / Soul's Attendant. 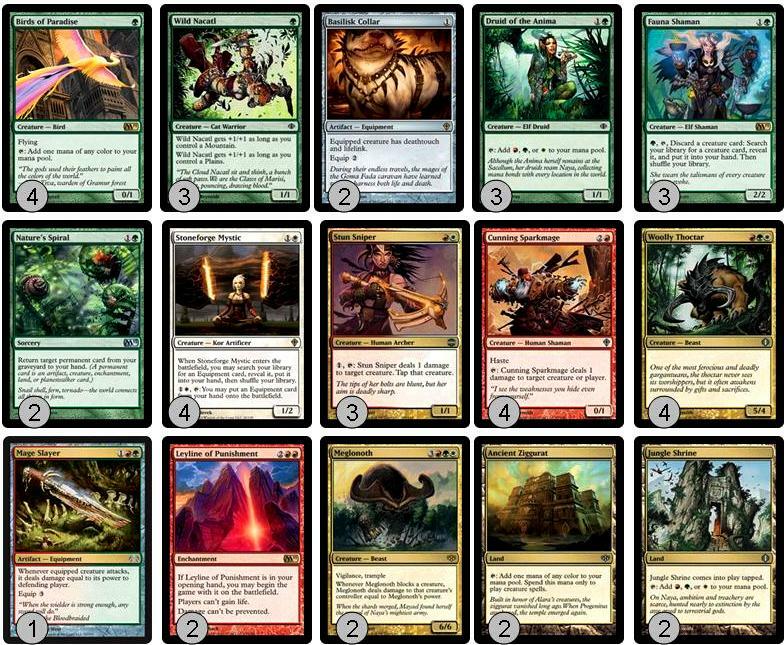 We did have this sort of deck put together within two weeks after M11 came out and it seemed that everyone and their monkey were playing it. If there is something we really do not like, it is playing a stoopid mirror-match. To this end, we will consign ourselves to construct a deck which hopefully wreck havoc on everyone's fav mono-white life-gain deck. First things first, let's yatter about the life-gain deck. 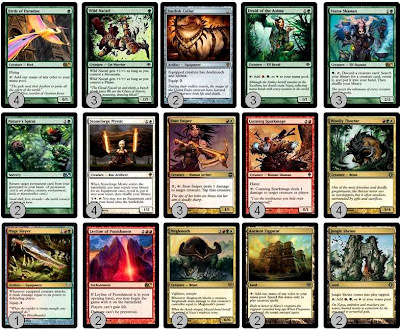 This deck list was put togehter by MTG pro-player Conley Woods who went 3-1 in U.S nationals. The deck is named Soul Sisters for some obvious reasons - the 4 Soul Wardens and 4 Soul's Attendants in the deck. Basically, it runs 8 copies of a 1 mana creature that allows him to gain life for every creature that enters the field. Gaining life is pretty sweet in this build given the fact that Conley also ran 4 Ajani's Pridemates and 4 Serra Ascendants. Essentially, this deck is based off the concept "Life is power." The rapid tempo in which this deck gains life directly relates to just how powerful and effective his creatures will be. Ajani’s Pridemate typically gets to rather an alarming size due to the fact that most of the decks in Standard play a lot of creatures to trigger the soul sisters. Also, Pridemate can get big quickly. For example, turn one Soul Warden, turn two Pridemate, a few more creatures from you and your opponent could turn the Pridemate into a 6/6 or 7/7 creature by turn three which not a pleasant thing to be looking at across the game table. The life gain from the sisters also helps you beat creature decks because you gain so much life that it’s hard for your opponent to kill you. Also, Serra Ascendant becomes a 6/6 pretty easily against those decks if you have one or two sisters on the battlefield. For example, against Mythic, Conley went turn one Soul Warden, turn two Soul Warden and Kabira Crossroads, and then turn three he cast 2 Ascendants that were both 6/6 (his opponent had played two creatures). Some of the challenges in beating this deck . . . I have a Mythic Conscription build as well as a Cunning Sparkmage / Naya Collar build - either of these may have to face down a Linvala, Keeper of Silence in the life-gain side-board. Also, Path to Exile, Oblivion Ring, and Celestial Purge can deal with many of the threats which we are thinking about sliding in a buiild. Perhaps we double the volume of pingers in the mix, throw in some removal, etc. One option is to get a Leyline of Punishment on board. Sure the last line of the card that says damage can't be prevented may be good but what is golden is the line before it which states Players can't gain life. So do you pack a four of and just mulligan until it is in your opening hand so you can play it for free? Please fill our head with some ideas as to what we should be bringing to FNM - drop us a comment - we would love to hear from the lot of ya. Altough the Magic the Gathering spoilers for Scars of Mirrodin have started to slowly filter out and the new card Sword of Body and Mind had been out in the open since last month, it has been only since this last weekend that gamers have been able to physically hold it in their hand with the release of From the Vault : Relics. We're thinking it à propos to give this card a brief review now. 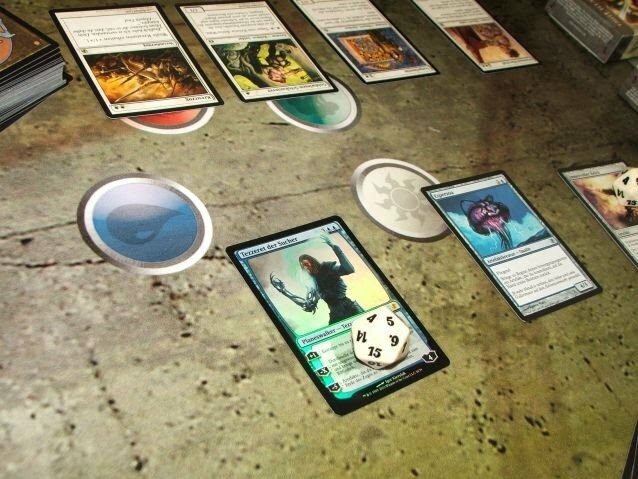 Whenever equipped creatuer deals combat damgae to a player, you put a 2/2 green wolf creature token onto the battlefield and that player puts the top ten cards of his or her library into his or her graveyard. Sword of Body and Mind, a Scars of Mirrodin preview card that is being included in the upcoming limited edition box set From the Vault Relics, was revealed at the Magic: the Gathering panel during the San Diego Comic Con. Since then, MTG forum members have been yattering quite a lot about it and speculating just how it may fit in the next set / block. Sword of Body and Mind is thought to be a wrap-up of the much loved powerful "Sword Cycle" from the original Mirrodin block. Equipment cards these days are given some serious thought as players can now 'tutor' it out of their deck with Stoneforge Mystic and equip it to some decent creature cards which could also be tutored out using Fauna Shaman producing some very exciting games at the kitchen table or your local FNM. Opening this card up in a limited play environment could be quite a bomb - just think of milling your opponent's entire deck in just three (un-obstructive) swings or being able to produce chump blockers. So a quick heads up - Scars of Mirrodin pre-orders are now up over at MTG Mint Card, so click on over and planning your set purchases before they are all sold out. Finally, a quick look at the name and number crunch as it stands right now - we're thinking quite a few artifacts as expected in the mix and perhaps even a few coloured / multi-coloured ones too . . .
We have some very exciting news for you . 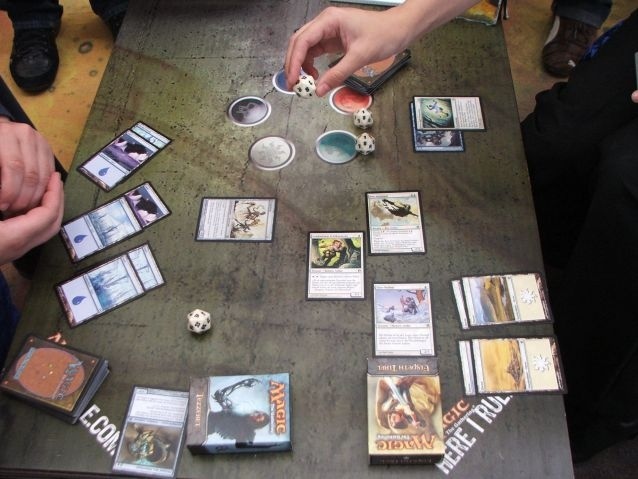 . . Magic: The Gathering Scars of Mirrodin spoiler season is now under steam and players everywhere are chomping at the bit to get this new set out of blister-packs and onto game tables. 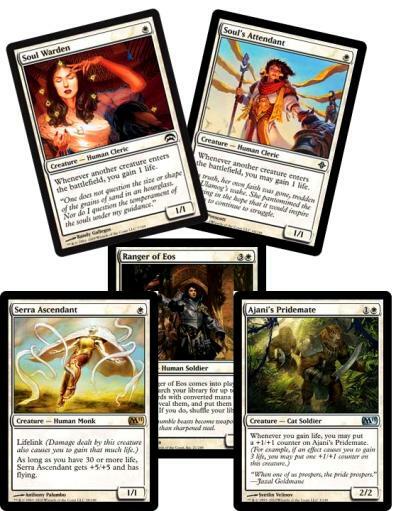 Late yesterday, casual MTG player LautaroLobos from Chile posted two images of cards from this set which was akin to dropping a bomb as one of the new cards contained a new powerful SoM mechanic - 'Proliferate'. 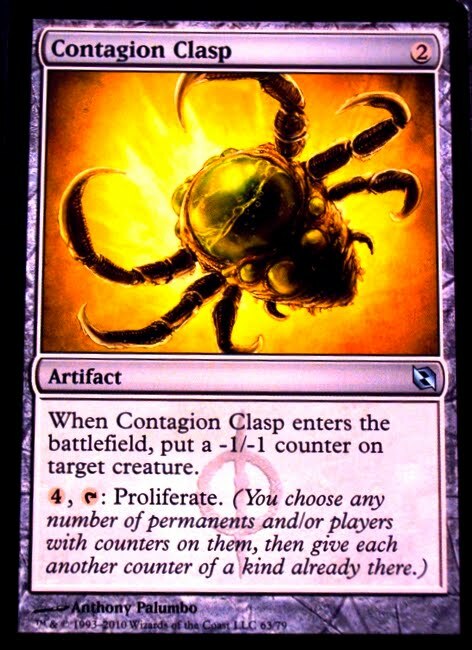 First things first, the new card with Proliferate, named Contagion Clasp, altough part of the very soon to-be-released Duel Decks: Elspeth vs. Tezzeret paints a good picture about Scars of Mirrodin, provides our second expected watermark, and new keyword - Proliferate. Let's have us a look . 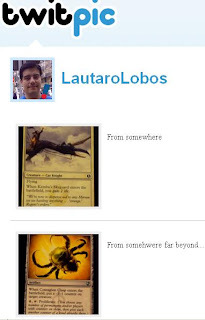 . .
Looks like we have a Phyrexia watermark on this this card, further confirmation of SoM affiliations. 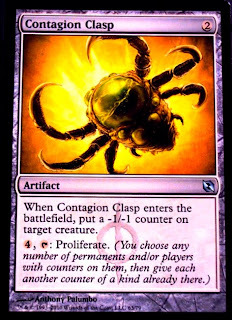 Contagion Clasp provides a -1/-1 counter right off the hop for 2 colorless mana, which which we say is not that bad at all, but the new keyword, Proliferate, will certainly impress you. Early indications is that Scars of Mirrodin will provide quite a few counters and will of course feature the other mechanic, Infect, which hands out poison counters as well as -1/-1 counters. Players are already yattering about using this card in a variety of different ways similar to discussions about the old Eventide card Gilder Bairn and are working out combos and synergies with Planeswalkers and cards from Zendikar block (the Ascension cycle, the Quest cycle, Expedition cycle, Levelers, etc.). 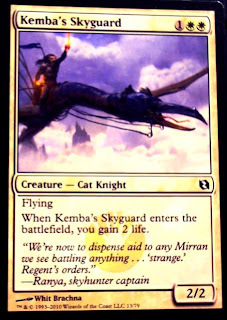 Next card up is Kemba's Skyguard, also a card soon to-be-released Duel Decks: Elspeth vs. Tezzeret. This is a decent enough common and a solid choice in limited play but what will catch players attention is the creature sub-type, Knight. 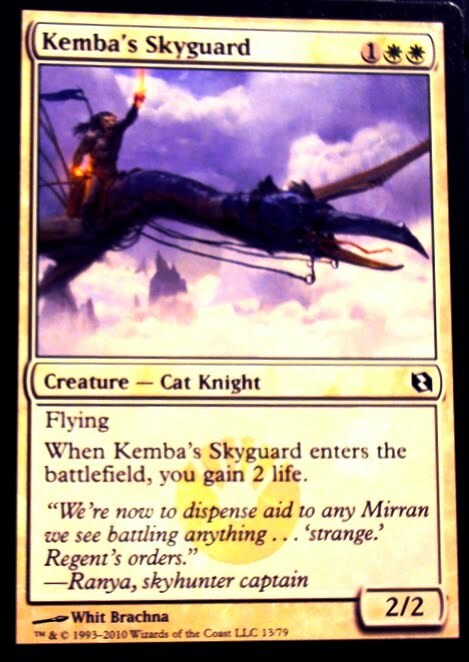 As Kemba's Skyguard is a Knight, this provides yet another option for players building a deck around M11's Knight Exemplar, which may be crucial as many very good Knight cards will be rotating out of standard when Scars of Mirrodin hits game stores. 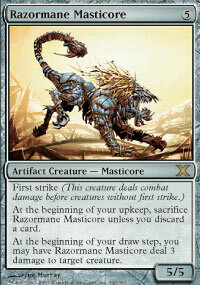 The life gain facet of this card could also be an option for players wanting to trigger Ajani's Pridemate. 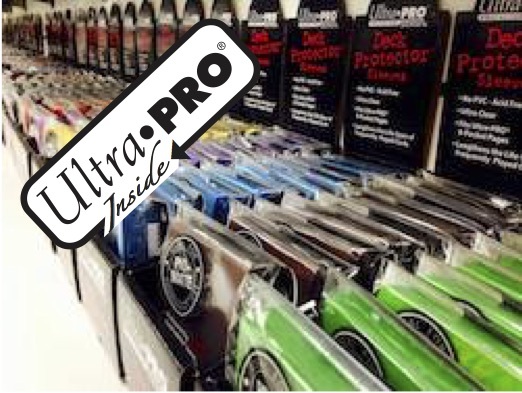 For the latest news, deals and promotions from MTG Mint Card, be sure you check out their Twitter feed here. They also are pretty good at posting the latest MTG juice on their FaceBook page. 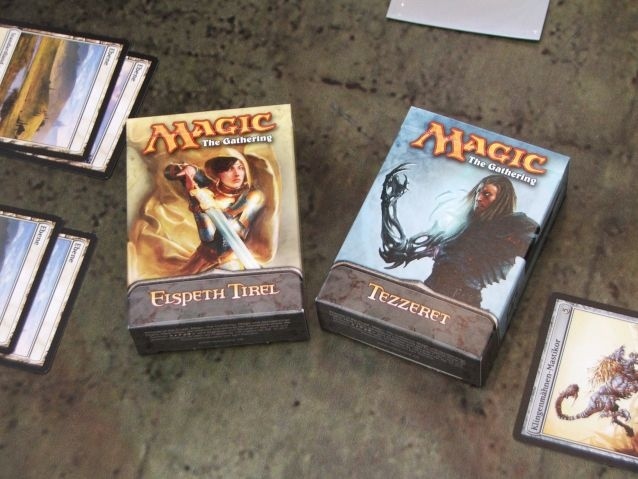 You may recall way back in May when we yattered about Duel Decks: Elspeth Vs. Tezzeret. Well, the official release date is still about a month away but we're starting to see all the spoilers wrap up quite nicely. This looks like a really decent product and we would expect almost anyone who picked it up to have some fun gaming. 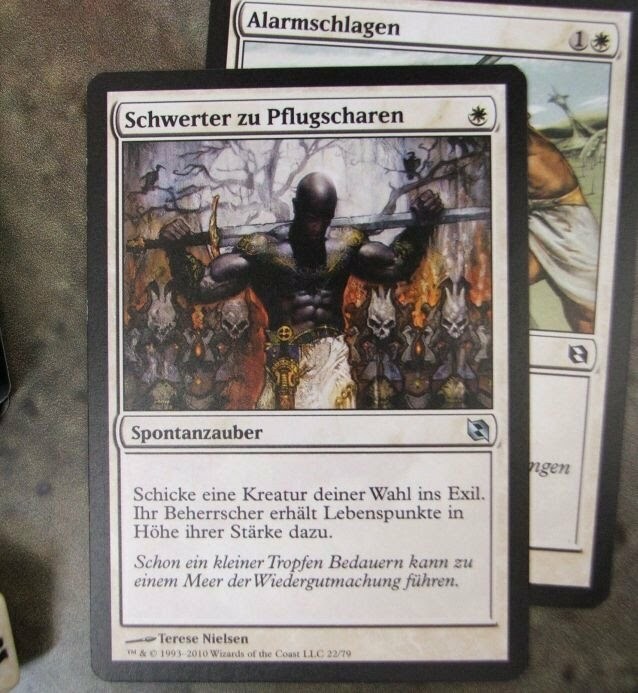 Just this past week during the Germany National Championship tournament, Wizards provided a preview and a few lucky players had a few games thus allowing us to pretty much complete the Elspeth Vs. Tezzeret card spoiler and list . . . that and no small amount of assistance from our fav spoiler monger, Captain Black.
. . . and the DD : EvT Decklists - Rares are in Bold, 'SoM' indicates that this new card is to be printed in the upcoming Scars of Mirrodin set. The new Crusade art is the da bee's knees y'awl ! 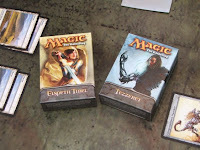 UPDATE : List officially released by Wizards today (8/26/2010) here. We're looking forward to getting our paws on this - drop us a line and tell us how much these are going for in your local games store. In today's Arcana over at Wizards, we have news of another new product - Grab-and-Go Event Decks. These Event Decks are designed to be strong, capable Standard-legal decks. This is a very interesting development and would certainly we have questions . . . a lot of questions. > How often will Grab-and-Go Event Decks be released ? We're thinking that in order to maintain its popularity with gamers, these would need to be released shortly after every new set in order to provide the latest card hotness. > Will these Grab-and-Go Event Decks overshadow the conventional theme decks ? Only time will tell but this product may be a nail in the coffin for theme decks. Price and selection of cards may be the only distinguishable difference. > Just how 'competitive' will this be ? We ask this as we are thinking that some competitive decks may be priced well out of range of the target market they want to focus on - the relatively new player who wants to get into a casual standard game via Friday Night Magic. The secondary singles market could take a hit here or some players may just purchase the Grab 'n' Go deck for the express purpose of extracting that money card and throwing the rest away. Daniel Tack of the Detroit Magic the Gathering Examiner had a good point when he pointed out the challenges to assemble an Event Deck "within reason, even for FNM level play where Jace, The Mind Sculptors and Primeval Titans run roughshod over all manner of homebrew hodgepodge." Lastly - we hope that these decks won't contain a bunch of craptastic rares no-one wants to play with or a collection of cards to showcase a new mechanic. There are quite a few challenges and we anticipate that should the decks be any kind of decent, it will never sell close to the suggested retail price (MRSP) thus missing the point to catering to the newer player who often has not yet decided if this game is for them. We're hoping that these will be somewhat similar to those World Championship Decks which were specially packaged versions of the top 4 decks used at the Magic World Championships (1997 - 2004). Here is the descriptive from the mother ship . . .
Each Event Deck is 60 cards, plus a 15-card sideboard—ready for all of your dueling needs! Also included: a Spindown life counter and strategy guide to help pilot your deck to victory. Best of all, they'll be available on February 25, 2011, just in time for Mirrodin Besieged Game Day taking place the very next day!